Organic modern cube tables in natural and bleached teak root wood with cracked resin design. Polished finish with unique wood variations on all sides. Handcrafted and multipurpose use. Expect variation in color. Multiple pieces are available and sold separately at $2,600 each. All orders will have different variations of wood and resin that will differ slightly from these images, as they are all unique pieces. 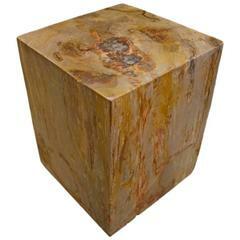 Organic modern cube side table or drink table made of reclaimed teak root wood from Indonesia. Gorgeous natural wood coloration and wood variations on all four sides. Sculptural reclaimed teak wood side table. We bleached the sides and polished the top to enhance the natural aged teak. Andrianna Shamaris. The Leader In Modern Organic Design.